Heat the coconut oil in a large Dutch oven over medium heat. Add the onion, garlic, and ginger and cook until softened, 5-7 minutes. Stir in the spices and cook until they're fragrant, about 1 minute. Add the chickpeas, tomatoes, coconut milk, cauliflower and sweet potato. Increase the heat to medium-high and bring to a boil, then reduce heat to low, cover, and simmer for 15 minutes. 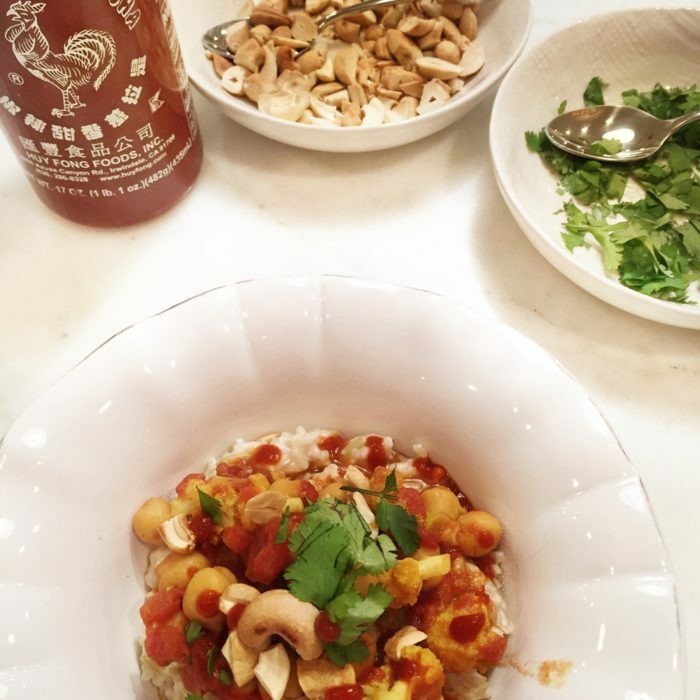 Serve with coconut rice and add cilantro, lime juice, chopped cashews and other garnish if you want. I know I will add everything, I just love the burst of flavors when all combined!!! To make the coconut rice, I just cook basmati rice with coconut milk, it mixes nicely with asian cuisine.